At this very moment I'm watching old episodes of The Bachelor. Cheesy, fantastic and cringe-worthy group dates and rose ceremonies. I love it. Later on I might make a burrito or attempt some sewing. This is my Saturday night...jealous? Long gone are the days I can go out two nights in row and still function. Instead I'm on the couch relaxing, Jimmy is out watching the footy game with the boys and I'm curled up in our apartment, happily watching trash TV. Although our place isn't my dream home, I love it here and more importantly I love the area. This place could do with a coat of paint, I secretly dream of ripping up the hideous blue carpet and I wish it was filled with the great stuff that I picked out on the Freedom Facebook Page but until we can afford a place of our own (does that ever really happen in Sydney?? ), this is home. 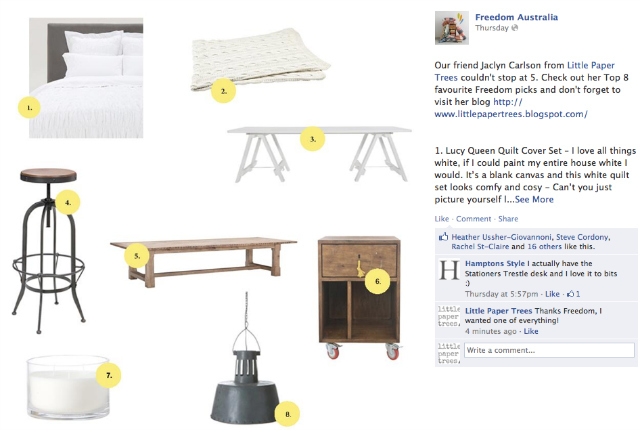 I've been coveting some of Freedom furniture! I'm about to move place and they have some amazing pieces! I love your picks!